Shabbat Evening Service⏤our major gathering of the week, led by the Rabbi and Cantor, is a lively celebration of Shabbat in words and music, followed by a convivial Oneg Shabbat in our Social Hall. Shabbat Morning Torah Study⏤a devoted group of twenty plus adults study the Bible, Jewish history and Jewish thought with the Rabbi every year. Sunday Morning Youth Service and Religious School⏤our Sunday School, from Pre-School to Confirmation, begins with a joyful communal service followed by Hebrew and Judaica classes. Sunday Afternoon Miscellany⏤any given Sunday might include a youth group activity, an adult education program, or our Poetry Garden gathering, so named because it often takes place in our beautiful meditation garden. Thursday Tutoring and Committees⏤our B’nai Mitzvah students meet year round with the Cantor and Rabbi, as do our various committees and Board of Trustees. 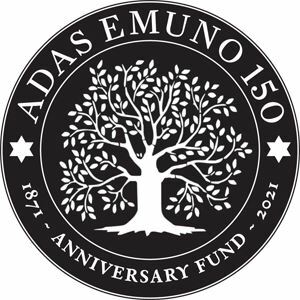 Of course, all the Jewish holidays (and there are many) only add to the celebration of Jewish life at Congregation Adas Emuno!